This book has a wonderful variety of almost 100 confections, which will make a perfect ending to any meal. There are some really unusual confections using tropical ingredients. This is a great resource for the chocolatier and confectioner as well as the pastry chef. Contents: Jams and Preserves. Chocolates and Candies. Breads and Pastries. Basic Recipes. 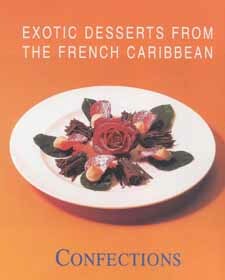 Exotic Desserts from the French Caribbean: CONFECTIONS has been translated from the original French edition of the book entitled "Délices des Îles - Confitures, Chocolats, Viennoiseries". Every pastry chef and confectioner needs this book!